The history of the gun tells the story of America. At its most fundamental, the history of the gun is the history of freedom. And it illustrates why freedom is a thirst within each man and woman's soul. Being set free unleashes the best in all of us. The story of freedom isn't reflected by the gun itself, but by the ingenuity behind it, the wealth to be made through it. This is why being allowed to work for our own best interests makes a better world for everyone. I’m going to hit some of the highlights of the progress made with guns in today’s blog post. 1364: First recorded use of a firearm - shooter lit wicks by hand that ignited gunpowder that was loaded into the gun barrel. Contrary to popular belief, the Chinese did not use gunpowder only for fireworks. In fact, the earliest surviving recipes for gunpowder can be found in the Chinese military treatise of 1044 AD, which contains three: two for use in incendiary bombs to be thrown by siege engines and one intended as fuel for smoke bombs. 14th century China: The matchlock firearms were first mentioned. The matchlock appeared in Europe sometime in the mid-1400s, although the idea of the serpentine appears some 40 years previously in an Austrian manuscript. The first dated illustration of a matchlock mechanism dates to 1475, and by the 1500s they were universally used. The Matchlock secured a lighted wick in a moveable arm which, when the trigger was depressed, was brought down against the flash pan to ignite the powder. This allowed the musketeer to keep both hands on the gun, improving his aim drastically. 1825: Percussion-cap guns invented by Reverend John Forsyth - firing mechanism no longer uses flash pan, a tube lead straight into the gun barrel, the tupe had an exposive cap on it that exploded when struck The percussion cap, introduced around 1830, was the crucial invention that enabled muzzle-loading firearms to fire reliably in any weather. 1835: Colt revolver - first mass-produced, multi-shot, revolving firearms Samuel Colt invented the first revolver, a gun named after its inventor "Colt", and after its revolving cylinder "revolver". In 1836, Samuel Colt was granted a U.S. patent for the Colt revolver, which was equipped with a revolving cylinder containing five or six bullets and an innovative cocking device. Before the Colt revolver only one and two-barrel flintlock pistols had been invented for hand held use. 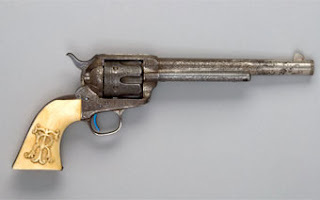 Colt revolvers were all based on cap-and-ball technology until the Smith and Wesson license on the bored-through cylinder (bought from Rollin White) expired around 1869. "Abe Lincoln may have freed all men, but Sam Colt made them equal." "The Gun that Won the West." I sometimes wonder if people today even know what Freedom truly is. What does Freedom mean to you? Where is the balance between guns and safety and crime and Freedom? America is the land of the Free and the home of the brave. But if we don't start being a lot more brave we're going to be a lot less Free. Tell me what Freedom means to YOU. 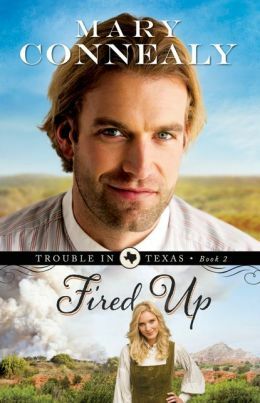 Fired Up, Book #2 Trouble in Texas Series, Dare Riker is a doctor who saves lives, but someone seems determined to end his. It may have something to do with the traitors he dealt with during the Civil War, or it might be related to the recent incident with Flint Greer and the ranch. Whoever the culprit is, he or she seems really fired up, and Dare can't let his guard down for a moment, which is a challenge, since right now he's trying to win the heart of the recently widowed Glynna. Glynna Greer came west as a mail-order bride and ended up in a bad situation. Now her husband, Flint, is dead, and she's determined to care for her son and daughter on her own. She wants to believe Dare Riker is as decent as he seems, but she's terrified to lock herself into another marriage. She plans to support her small family by opening a diner--never mind that cooking is not her greatest talent. The men in Broken Wheel, Texas, are so desperate for home cooking that they seem willing to overlook dried-out beef and blackened biscuits. Glynna can't help but notice that danger follows Dare wherever he goes. There's the avalanche. And then the fire. But things really get out of hand when someone plunges a knife from Glynna's diner into Dare's back. Are Flint's cronies still plotting revenge? Is Glynna's son engaged in a misguided attempt to protect his mother? Is a shadowy outsider still enraged over past injustices? And can Dare survive long enough to convince Glynna to take another chance on love? Mary Connealy writes fun and lively "romantic comedy with cowboys" for the inspirational market. 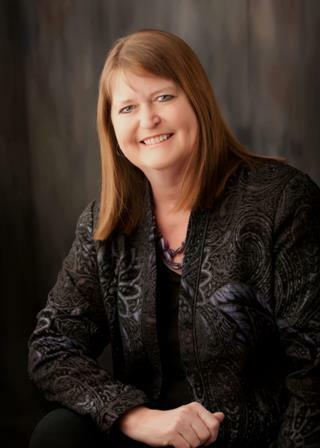 She is the author of Swept Away, her twenty-sixth book and also the bestselling Kincaid Brides, Lassoed in Texas, Montana Marriages, and Sophie's Daughters series, and she has been a finalist for a Rita and Christy Award and a two time winner of the Carol Award. She lives on a ranch in eastern Nebraska with her husband, Ivan, and has four grown daughters. Thanks visiting CFHS today and posting this fascinating info about gun history. I didn't realize they'd been around so long. what a timely and fascinating post. Though I am not a gun owner, I do fully support the right of those that do. I found the history to be quite enlightening. Thanks for guest posting, Mary. Mary is in the house!!!! Hey, Mary, thank you for such an informative post. I've dug around and around on the history of guns in America until I couldn't see straight. Thank you for sharing this history of the gun, Mary! To me, freedom IS owning a gun or having the right to. The right to keep and bear arms is essential to our personal freedom and that of our nation. May we never give up this liberty our forefathers set forth! The right of self-defense never ceases. It is among the most sacred, and alike necessary to nations and to individuals. Great post, Mary! You did a "bang-up" job showing the evolution of the gun. :) Love the quotes about Sam Colt and the one by Ben Franklin. Great job! Enjoyed the post, Mary. I had no idea gunpowder and guns had been around for so long. I do remember reading about flintlock guns, but have to do research every time I want to use guns in my manuscripts. Kathleen what I find honestly, most fascinating about the history of the gun is that it is the story of innovation, how a man inventing a better way could get rich, inprove the lives of those around him, build a better mousetrap (if you will) and have the world beat a path to his door. It's a perfect representation of why America works. Why Capitalism works. Why the profit motive makes life better for all of us. Because it's not just guns. It's true for cars, and matches and canned peaches and sewing machines and fabric. Everything. Make it better and it'll be worth your while and it'll make everyone's life better. Hi Christina. I just learned some MORE things about guns for my current work in progress. My hero has a Yellow Boy rifle. I just found it sort of randomly and chose it because it was popular in that era and then TADA, I found one in a museum. And there was a guy there, totally irresponsible I'm sure, who let me TOUCH IT!!!! He talked me through loading it (he didn't actually let me do THAT Much) and it was strange how it was loaded, very very interesting and I brought just tiny bits and pieces of that into my book and who knows, maybe I didn't bring it, but I felt like I knew and and I guess I always hope that shows in the writing, that my hero is handling his gun with full knowledge of how to do it. DEBBIE LYNN COSTELLO! I just met you! It is so NICE to see familiar names and finally have a face and voice to put with them. ACFW Conference is so special for doing that for me. And the gun violence in our country is awful, just awful. Everytime something terrible happens I wonder, like I'm sure everyone else does, what can be done to stop it. Right now I'm thinking we just have to stop turning a blind eye to madness in our midst. In the name of tolerance or acceptance or maybe apathy, we see desperately troubled people and just walk away from it. All the mad houses are closed because they're too cruel. All the prisons turn people out too soon. All the judges find excuses to let felons and just misdemeanor thugs wander around free. No one wants to be the one to look a troubled person in the eye and say, "You're dangerous. You need to be locked up before you do something terrible." And I know why they feel that way. But wow, I think we're coming to the time when we have to admit we've gone too far in looking the other way and hoping for the best. Here's a statement you can debate if you want. A bit shocking but I'm afraid it's true. Those signs with a gun on them and a red circle around the gun with a red slash through the gun? I think those signs might better say, "We're defenseless in here, please come in and attack." Britney, I always liked the moment in Quigley Down Under when the bad guy challenges Quigley to a real western style shoot-out, thinking Quigley is a great marksman with his rifle but not skilled with a six gun. So he says, "This ain't Dodge City. And you ain't Bill Hickok." Then he shoots three men before any of them even draw and says, "I said I never had much use for one. Never said I didn't know how to use it." HI RAMONA! It was nice to see you in Indianapolis, too. It is just so nice to once in a while, get out from behind the computer and talk to real people, instead of my imaginary friends. And now I'm back with my imaginary friends and its good. I missed them terribly and am back to getting them into awful trouble. Gunpowder is OLD, Martha. They say the Chinese used it at first in ceremonial ways for Fireworks but they figured out it made great weapons really fast! Mary, thanks for the interesting post on the history of the gun. Personally I do not like guns. Guns scare me. But I treasure the right of our citizens to bear arms, one of the guarantees of the constitution and vital to freedom. Honestly, I dont' have much to do with them either. My Cowboy likes them, but me, not so much. I've fired a few in my day, but they are so LOUD. My poor hearing is already not great. I need ear plugs. Enjoyed the post, Mary. Very informative. I had no idea guns have been around for this long. I sometimes watch old western movies and tv serials with hubby from Netflix. Sadly,I live in a city with a high amount of illegal ownership of guns and in some neighborhoods violence on the street. I very much agree with your thoughts on guns and the increase in violence that has devastated the lives of so many recently. Thank you for being here. Your post was fabulous, and I learned a few things today. Thanks for sharing. I believe we should be able to own guns. The biggest problem is that some people have hair trigger tempers and no respect for their fellow man. It scares me that some people think that outlawing guns will solve the problem. I had no idea that guns have been around as long as they have.Thank you for all the info. Hi Pat Jeanne. I wish I knew how to solve all the crime. I do know. I think we all do. But it's not a popular opinion and I'm not going to write it down here. Sorry. Jan Hall, they go way, way, way back don't they? I recently watched a show on...oh, you know, the history channel or somewhere called The History of the World in Two Hours and it was really interesting. It REALLY hit the high notes of course but it was fascinating. Gunpowder made the list. Trade routes. Wars and dynasties and plagues and world religions. Pretty compelling. Of course they had to get in a few biased shots but really how could they take the time? They only had two hours for the whole history of the world! This is an interesting post, Mary. I think with freedom must come responsibility. However, having freedom also gives us the freedom to determine those responsibilities and freedoms. I hope this isn't too convoluted for anyone to understand what I'm trying to say! I love your books so appreciate the chance to win a copy of Fired Up. Loved the quotes! Huge 2nd Ammendment and NRA supporter and soon-to-be member of the Women of the NRA Network! Freedom is not free—a lot of people died for it! I really love these nuggets of history. Freedom has always come with a large price tag! Freedom means living in a country where we can worship our Lord and Savior Jesus Christ without fear of being punished. Freedom means we should have the right "to freedom of speech"...sadly this is not true anymore. Freedom means a right to bear arms. Is that going to be taken away too? Our freedom has cost a lot of lives! May we always appreciate our Armed Forces! Praying that God continues to Bless our Country! Thank you for this interesting post Mary. I would love to win a copy of Fired Up! Guns don’t make us free but they do make it very hard for a government to take our freedoms away without our approval. My worry is that too many Americans are willing to give up their freedoms, and thus ours as well, in order to get ‘free’ stuff from the government. The ancient Greeks claimed that democracy could never last because as soon as the people discovered that they had the keys to the treasury, they would loot it. We not only have looted the treasury, we have figured a way to loot money that isn’t even there. The future money of people yet unborn! Now that’s something to get “Fired Up” about. Mary, thank for for the gun history lesson! I enjoyed it. And, I loved Ben Franklin's quote. Freedom is not free it is bought with blood. Mary, what great history about the gun. Guns have been around for many, many years and the thought of people wanting to do away with them or having our right to bear arms taken away from us, THIS IS WRONG! We are a free nation and our freedoms have been fought for and died for and continue to be to this day. Let's continue to be a strong nation, hold fast, stand for what is right, and thank God for everything he has given us and blessed us with. Thank you for the interesting post on guns, Mary! Totally agree with you on the issue of violence in the U.S.. Freedom, to me, means the right to worship as I please, the right to protect myself, & the freedom of speech. Mad & sad that these freedoms are gradually being taken away from us! Thank you for the history! It's always fun learning! Mary thanks for posting the information about gun history. It was very interesting. I love hearing your perspective through your comments you posted. I think freedom comes in many forms whether it be constitutional- free will or just personal freedoms we aloe ourselves. I'd love to see your blot post about quilting! Mary I really learned a lot through your article about gun history. I have to tell you I strongly believe in the right to bear arms. The freedoms in our country are slowly being taken away from us. If we give up the rights that were bought by the blood of our citizens we will never be" Free" What will we really be willing to give up next? Personally i'm afraid to use a gun but I am not willing to give up my right to own one. Your quote by Ben Franklin and your quote are right on. It is God who gives us our rights we cant let others take it away. Freedom is just that the right to be free. Freedom to me means that I can raise my family, earn a living, and practice my religion without being inhibited by others or the government. Thanks for the history and the giveaway! Thanks for this information. Freedom in the natural means the ability to make my own choices and to reap my own consequences or benefits. Freedom in the spiritual realm has everything to do with giving up my self-will to God. Janalyn, I really like that! Very well thought out.